Check off your bucket list of US travel destinations one state at a time with our Teal Dream Map. This map of the United States is rich in topographical terrain and is highly detailed, making it an excellent choice to show off your travels. The calming teal oceans and modern frameless design of this gallery wrapped canvas pin map, will ensure it makes a splash on any wall. This piece of custom map art will have you reliving favorite memories from past travel adventures while also helping you plan out that next big road trip. Further your love for travel and brush up on your geography knowledge as this US pin map has the capitals of all 50 states labeled and highlighted with a star. 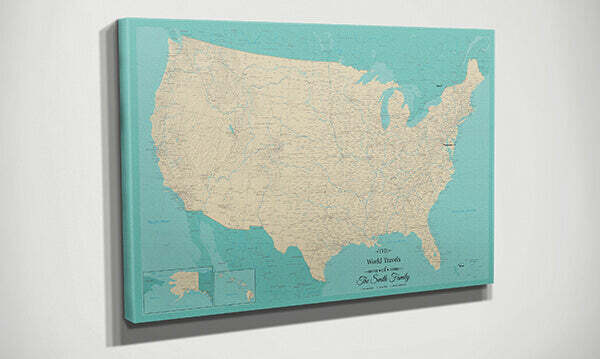 With its frameless design, our Teal Dream Map with Pins is timeless and is sure to match any decor. 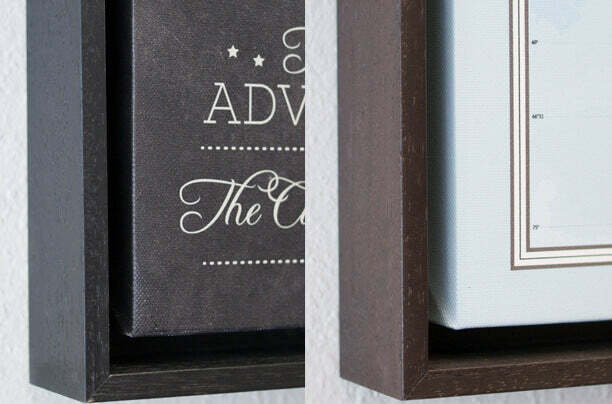 Makes a creative and thoughtful gift for the travel enthusiast in your life! With clean modern lines due to its frameless design, our Gallery Wrapped Canvas Pin Maps draw all the focus to the beauty of the map itself, creating a timeless interactive art piece you will be proud to show off to friends and family for many years to come. Our Frameless Canvas Maps are printed on premium canvas for an upgrade that will give you a rich, textured look and feel that ensures your map will stand out prominently wherever it is hung. Each canvas map is printed in house using our fancy-schmancy latex printer which creates a vibrant print that truly looks like a work of art! Did we mention that our Canvas Pin Maps make the perfect 2nd Anniversary Gift idea, which is traditionally the Cotton Anniversary? Pin where your love has traveled on your personalized Gallery Wrapped Canvas Map! Got a personalized map for an anniversary gift! It went over very well. Absolutely love it! Map was AWESOME!! We absolutely love it! Looks gorgeous and came with all listed items! Thanks for such a thoughtful gift!